If you love PC and online gaming, and are looking to take it to the next level, we have just the competition for you. To hone your gaming craft (and to help you better defeat your enemies) we're happy to offer one lucky reader the chance to walk away with a gaming combo consisting of mouse and keyboard, courtesy of SPEEDLINK. 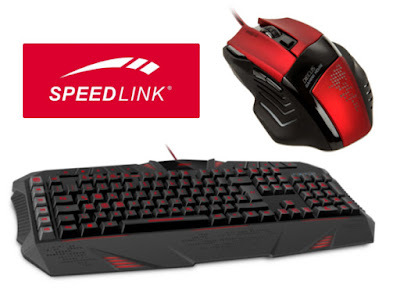 The prize includes a Limited Edition Decus Gaming Mouse, and also a Parthica Gaming Keyboard. The Decus mouse is the ultimate gaming controller, as you can customise all of the many buttons using the included software to suit your needs for each game you play. It features rubber grip panels at the sides, and an extra grippy track wheel on top. Oh, and IT LIGHTS UP! Cycle through different colour combinations to chose you favourite, or let the lights respond to the action on screen. RRP £34.99. The Parthica Gaming Keyboard offers gamers precision and comfort during long hours of playing. All the buttons are programmable, and the keyboard has different game profiles which can be switched between to better enable players to be more flexible during games. Oh and IT ALSO LIGHTS UP! This lets you see what gaming profiles are activated without actually looking at the keyboard – so you won't have to take your eyes from the killing shot. RRP £39.99. The competition will close at 6pm on 4th March 2016 and the winners will be notified soon after. UK entrants only please. To win the entrants must have 'Liked' The Test Pit's Facebook page. The judges' decision is final. For T&Cs please send us an email.